Did you feel that? Just now when you navigated to this website, did you feel that cool, comforting sensation? That, my friend, is the feeling of Lucky for Life. As sure as a magnificent double rainbow stretching from horizon to horizon, and acres upon acres of four-leaf clovers, just $2 gets you that much closer to winning $1,000 a day, every day, for the rest of your life. With 365 days of prizes a year (plus an occasional leap day), this is the game that keeps on giving seven days a week. Who says Mondays have to be terrible? You may even start looking forward to them! And with drawings every Monday and Thursday, you have multiple chances every week to change your luck without covering yourself in ladybugs or carrying around all those horseshoes. So take a chance – you might get lucky. Say hello to Lucky for Life. Pick five numbers from 1 to 48 and one Lucky Ball number from 1 to 18. Or simply ask your retailer for a Quick Pick. Each Lucky for Life ticket is $2. The Lucky for Life top prize is won by matching five white balls, in any order, plus the one gold Lucky Ball number. The second-level prize of $25,000 a year for life is won by matching all five white balls, known as a Match 5+0. You can win eight additional ways by matching fewer numbers (see Prizes & Odds chart for details). * "For life" prizes are guaranteed for a minimum of 20 years. A Cash Option may be available. "For life" prize winner must be a natural person who is at least 18 years of age. Multiple individuals on one ticket, and legal entities such as corporations, partnerships, trusts and estates, are only eligible to claim the guaranteed portion of the "For life" prize without the annuity feature or elect the Cash Option. † Prizes may become pari-mutuel, meaning that the prize amounts are shared equally among all winners of the available pool for that prize level. 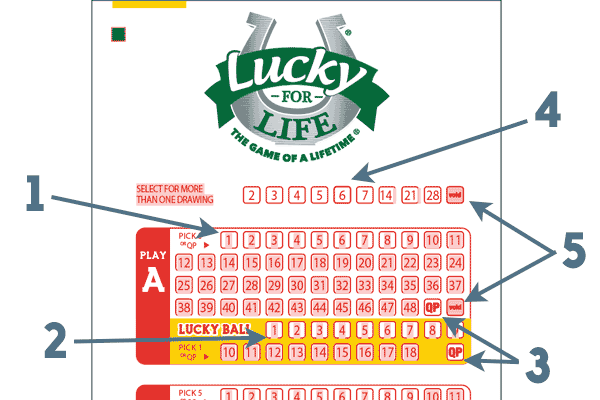 Lucky for Life sales end at 9:30 p.m. on Mondays and Thursdays and resume after the drawing. Once a ticket is generated it can't be canceled, so check your play slip to make sure everything is correct. The draw video is available to watch online at approximately 11:45 p.m. on draw days.